But if you stick around for the end credits scene, there are another two alternate Spider-Men teased. The clip is set in another alternate universe, we’re introduced to Spider-Man 2099 aka Miguel O’Hara – the first Latino Spider-Man. It turns out he’s managed to create an inter-dimensional travelling device he wears on his wrist. Using it for the first time he ends up in Earth-67, which is the universe of the 1967 Spider-Man cartoon. Landing in the 2-D world, Spider-Man 2099 points at Spider-Man ’67, recreating the pointing meme/GIF that’s very popular on social media. Apart from this hilarious post-credits scene, it’s clear Spider-Man 2099 will most likely appear in the newly announced sequel. It’s also worth pointing out that Miguel is voiced by Star Wars actor Oscar Isaac. While the 26-year-old Spider-Man from Miles’ universe who dies at the beginning of the film was voiced by Chris Pine. 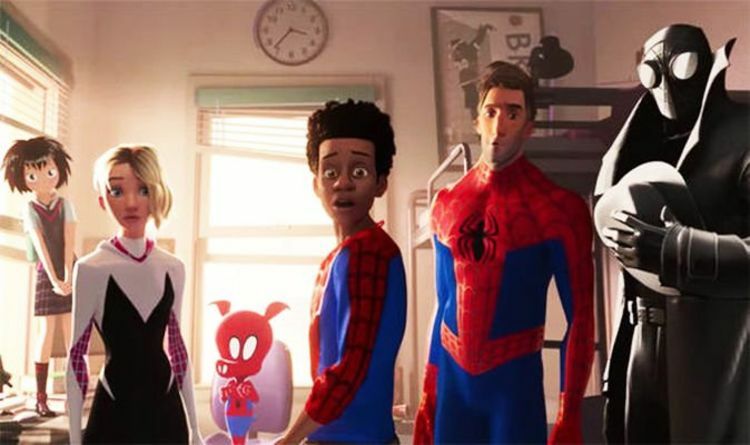 So what will the Into The Spider-Verse sequel’s plot be? Well at this stage our best guess is it will see Spider-Man 2099 travelling across the multiverse and bumping into some of the Spider-People we’ve already met, while introducing others. Hopefully, more of the film will be set in other universes. We’d love to see more of Spider-Ham’s and Spider-Man Noir’s dimensions. Spider-Man Into The Spider-Verse is in UK cinemas on December 12, with previews from today.